The elephant in the subconscious tells the individual that the political class wields power over them, but the discomfort of this nagging truth is alleviated by labeling politicians and bureaucrats as “public servants,” with statements such as “we are the government,” mitigated by the belief that “we” hold ultimate power with our vote. After all, we can “throw the rascals out” anytime they don’t do our bidding. But even more powerful is the assumption that politicians act in “our” best interest, that the people who enter into the realm of “public service” do so to help others, which implies that they are on a higher moral plane than the average person. As for the government bureaucrats, it is assumed that they are necessary to fulfill societal needs that cannot, or would not, be provided without a government. In the case of welfare, for example, this implies that the rest of us would not take care of our fellow man because people are greedy and self-interested, but those who enter into “public service” do care, and that their willingness to step up and provide something that other people will not indicates a higher degree of honor and selflessness. Here’s the key: This entity we call government is nothing more than a collection of individuals, and ALL individuals act in their self interest. Politicians are not altruists. They do not care about people any more than any of the rest of us. They don’t subordinate themselves to “serve” others. There is no such thing as selflessness. Any choice that an individual makes is an expression of self interest – even the most charitable act is performed because it provides psychic reward to the individual. But politics is not charity. Politicians and government bureaucrats are not “serving” the rest of society, they’re pursuing their self interest, and those interests are either the attainment of power over other people, or a cushy, stable job with lucrative benefits from which one is unlikely to ever be fired. When you build an institution that has a monopoly on the use of force, the people who will aspire to join its ranks are those who wish to wield that power over others; to reward their friends and punish their enemies. They’ll ally themselves with the worst element of the private sector that will provide them with wealth in exchange for protection from competition in the marketplace. It is difficult to attain wealth and status in a free market – these people are unfit for such enterprise. They use force to get what they want. 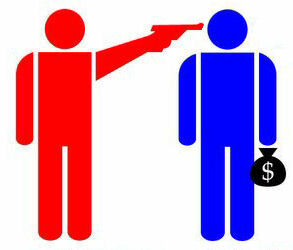 They steal and call it taxation. They murder and call it war. They rob the people of their liberty under the guise of protecting them. They impoverish future generations while they plunder the present and steal from the future with debt. They are authoritarian sociopaths representing the worst element of humanity. Politicians and high-level bureaucrats are not to be regarded with esteem, but derided with scorn. Why do government employees pay taxes? Imagine a band of stagecoach robbers with one dominant leader. After a successful pillaging of some hapless travelers, they divvy up the booty. The gang leader takes his cut, then distributes shares to the henchmen. Then he demands that each henchman give back 30% of what they just received. Wouldn’t it be much simpler to just give them 30% less in the first place? The money the state expropriates from the productive sector pays for the cost of government. “Taxes” paid by government employees are nothing more than an exercise in moving money from the right hand to the left, and then back to the right. It’s a shell game designed to blur the distinction between the productive sector and the thieves who rob them of their wealth, to mask their plunder and make it appear as though they are “one of us,” just another taxpaying citizen. If they did not pay taxes, it would make it clear that they do not obtain their money by adding value in the productive sector like the rest of society. It would reveal them as a separate class of individuals who live off the wealth created by the production of the underclass; as nothing more than a garden-variety parasite. The most menial job in the marketplace is nobler than that of a politician or bureaucrat, because the common laborer earns his wage through voluntary exchange, providing products and services to people that have a choice to buy or not buy. He must satisfy his customers to survive. Government is a monopoly; there is no choice. You pay whether you value the “service” or not, and it doesn’t matter if you’re left unsatisfied, you can’t take your business elsewhere. Politicians and bureaucrats are nothing more than a band of thieves writ large, with less honor than the common highwayman. It is Us and Them, and from their perspective they are the privileged class, we are mere mundanes who must submit to their rule and produce – so that they may leech from our productivity. Very interesting! I had not really thought about this before. Aren’t there countries in which the government employees don’t pay taxes? I thought I read somewhere that government employees in the UK don’t, or used not to pay taxes. It truly doesn’t make sense. I think the term “Authoritarian sociopath” describes my old boss pretty well. A lot of us over in Broward County were praying for the day when our former County Commissioner Debbie Wasserman Schultz finally didn’t get her way… thank you, America, for making that happen.